Recently, several new locker services have expanded your left-luggage options in Venice. We link to the services and help you decide the best way to store your bags. 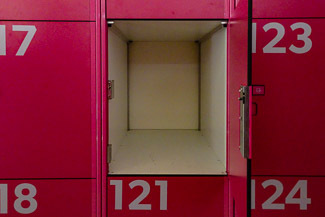 ABOVE: An open locker at Vaise offers relief to a heavily-laden traveler. In Venice, it isn't hard to find traditional deposito bagagli or left-luggage services at Marco Polo Airport, in the Piazzale Roma, at the Venezia Santa Lucia railroad station, and a handful of other locations. Luggage lockers, in contrast, are something new: They arrived in Venice during 2017, when a young entrepreneur named Martina Pignaffo opened two Vaise locker locations. This firm has locations in Venice, Milan, Florence, and Naples. Its Venice shops are in the Calle dello Spezier (near Venezia Santa Lucia Railroad Station) and the Calle de l'Orso by the Rialto Bridge. This location may be out of the way for most travelers, but it's handy if you're staying near the Ghetto or elsewhere in the sestiere of Cannaregio. Normally, we'd suggest leaving bags at your hotel if you need to check out before it's time to catch your airport bus, airport boat, or train--or, for that matter, if you arrive before your room is ready and want to go sightseeing without hauling cargo. You're carrying valuables (such as jewelry, cameras, or a laptop), and you don't feel comfortable parking them next to a hotell's reception desk or in a hotel luggage room. You've been out shopping, and you want to leave your purchases in a safe place while you visit a museum, have a meal, take a gondola ride, or go sightseeing on foot. You're staying in a vacation apartment, rather than a hotel, and you don't have access to a reception desk or luggage room. If you expect to be in any of these situations, luggage lockers or a traditional deposito bagagli counter can be a huge convenience. Deposito bagagli counters or shops tend to be at major transportation points such as the Piazzale Roma (for airport buses and taxis), the Marittima cruise port, and Venice Marco Polo Airport. If you're staying a long way from these locations, it may be more convenient to rent a luggage locker in your hotel or apartment's neighborhood. A locker may also be cheaper than a deposito bagagli if you have more than one bag, as long as you can stuff everything into one locker. And with a locker, you won't have to stand in line. On the downside, a locker can be more expensive if you're parking only one bag or leaving your luggage for several days. We suggest determining your needs, then looking at the Web sites featured in this article and on our Left Luggage / Baggage Deposit page. You can then compare costs and decide where to store your gear.